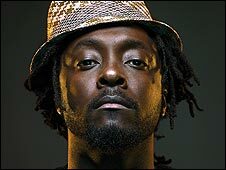 Rap star Will.i.am is releasing a new song and video to mark Barack Obama's win in the US presidential election. The musician spent election night editing the final version of It's A New Day, which is set to make its internet debut on Wednesday. The Black Eyed Peas singer said the song was a tribute to the American people and their part in events. Will.i.am scored a viral hit with Yes We Can earlier this year, in support of Obama's White House bid. It set an Obama speech to the rapper's music and racked up millions of hits in February. The song also featured vocal contributions from stars including actress Scarlett Johansson, jazz legend Herbie Hancock and Pussycat Dolls frontwoman Nicole Scherzinger. The new song and video is due to debut on the Dipdive website. Will.i.am also asked for celebrity video contributions for the project. He said: "The whole thing is really for people to leave testimonials... to create a page and leave testimonials on how they feel about this American accomplishment." The musician, who scored a top ten hit with Girls Aloud star Cheryl Cole in April, spent part of election night in Chicago, where Obama delivered his victory address.